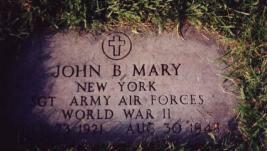 (Click to enlarge, 36K) John Bernard Mary was born on July 23, 1921, in Buffalo, NY. John was the son of Edward and Martha (née Schwert) Mary. He was brother to Grace Elizabeth Mary and Olive (née Mary) Mammoser. John was born two months premature, had club feet, and a humped back. A chiropractor straightened out John's back. 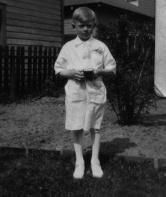 When John was only a year old, Dr. LeBrun, the famous World War I surgeon, operated on his feet at Buffalo General Hospital. Edward Mary had been opposed to such surgery. One day, while Edward was at work, Martha bundled John up and carried him all the way to the hospital -- a distance of about 3 miles. Martha made the right decision, as John grew up to be tall and straight -- and to love life. John's hobbies were camping, hiking, fishing, woodcarving, and rollerskating. 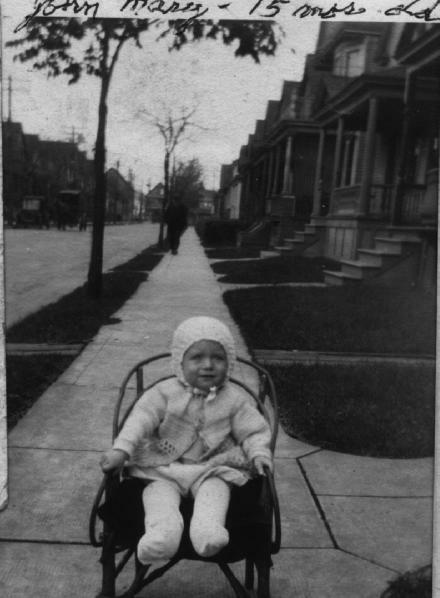 His first bike was awarded to him by the Western Auto Store on Main Street in Buffalo. The bike was awarded because John was so prompt with his payments. The time punch clock recorded John's payments each week at the exact time, so they gave him the bike. John had a great sense of humor and many friends. John was the "Western Union Boy," delivering telegrams with his bike. For a while, he worked at the Bemis Bag Company on Northland Avenue in Buffalo. 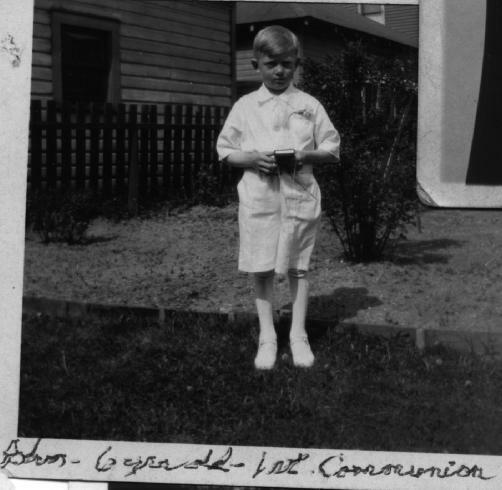 John was also a "fireman stationary engineer" at Sisters Hospital on Main Street in Buffalo. 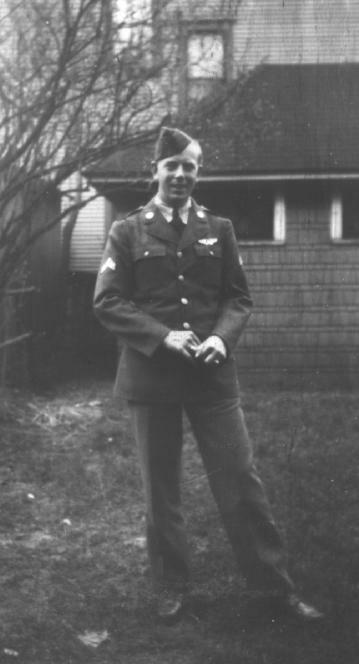 John served as an airplane mechanic in the U.S. Army Air Force during World War II, 1942-45. One day, while working on an engine, the propellar backfired, striking him in the groin. He later developed cancer from his injuries. John died on August 30, 1948, at the age of 27. He is interred in Lot D, Section 250, Mt. 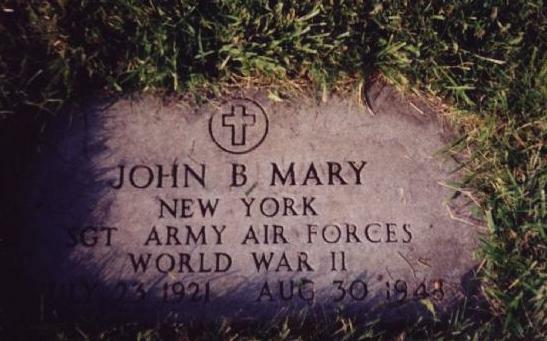 Calvary Cemetery, Cheektowaga, NY, along with his parents, his sister Grace, and Rev. John B. Schwertfeger/Schwert. Text written by Olive Mammoser, sister of John Bernard Mary. Schwert cousins. 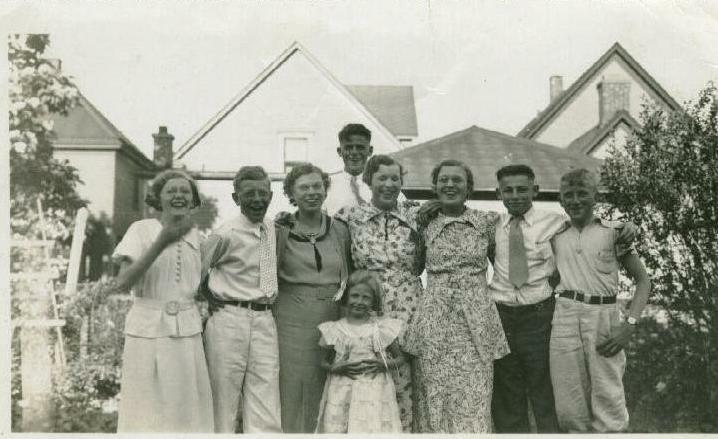 In the front-center is Olive Mary. 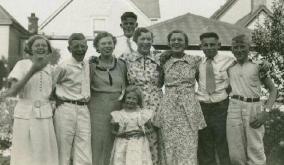 In the second row, left to right is: Grace Elizabeth Mary, John Bernard Mary, Mildred Mayer, Dorothy Schwert, Marie Schwert, Arthur Mayer, and Francis Schwert. In the back-center is Gerard Mayer. 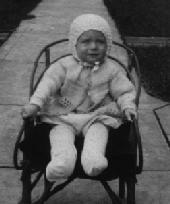 Photo taken on June 21, 1936. 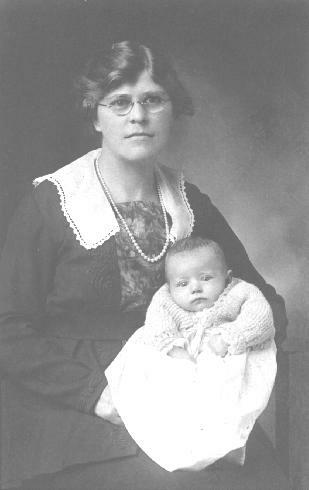 Martha Ruth (née Schwert) Mary: Born 1892; died 1977. 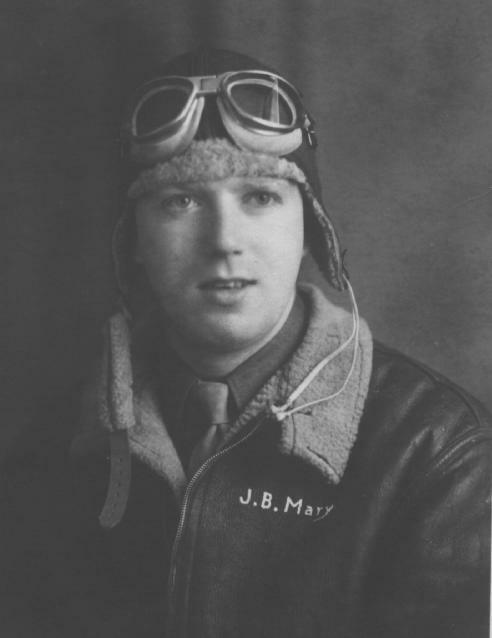 Edward Mary: Born 1886; died 1961. Grave of John Bernard Mary. Lot D, Section 250, Mt. Calvary Cemetery, Cheektowaga, NY. Letter to Home: Written on V.E. 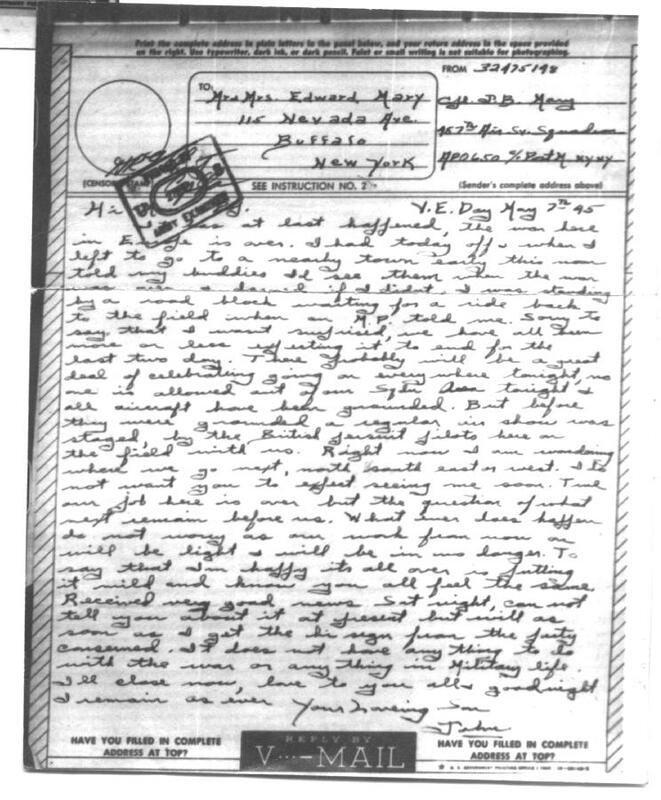 Day (May 7, 1945) by John to his parents. 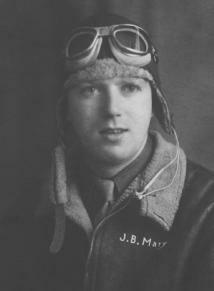 Obituary: John Bernard Mary, August 30, 1948. 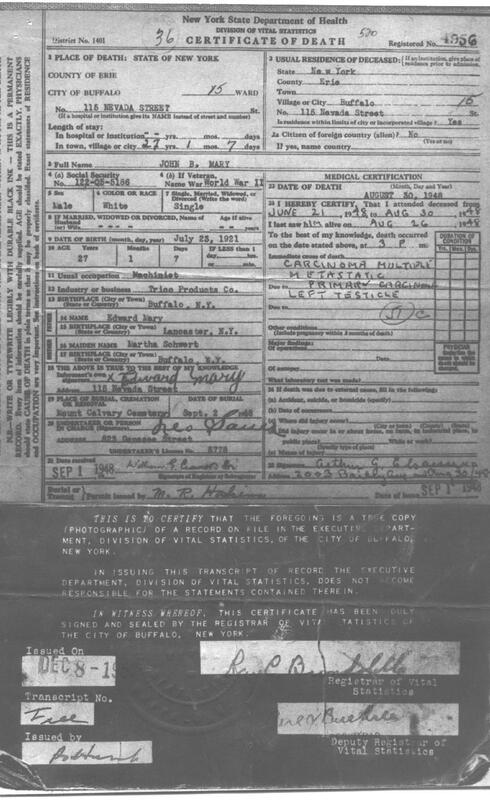 Death Certificate: John B. Mary, August 30, 1948. 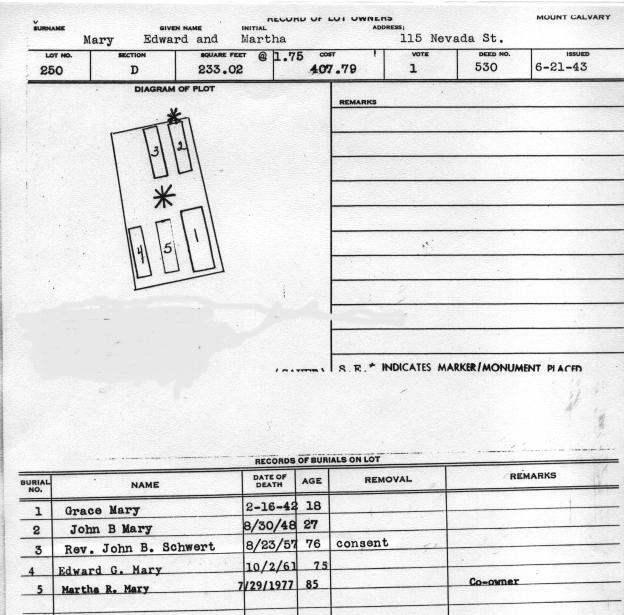 Cemetery Lot: Official lot record from Mount Calvary Cemetery, Cheektowaga, NY, for John Bernard Mary.